Route 6 crosses the northern tier of Pennsylvania. It can be reached from the east at the town of Milford, PA and at the western boundary, from the town of Pennline, PA. It is north of I-80 and is an excellent alternative to that super slab. U.S. Route 6 passes through towns and villages whose boarded up buildings and rough exteriors could easily deceive those who rely on hasty first impressions. It requires a short visit, a cup of coffee in the diner, a walk in the square, and a chat with passers by to find the proud, hardworking communities that still exist. These are communities whose labor fueled the industrialization of this nation - Mining towns that were populated by immigrants from all regions of Europe. And judging by the long lists of names on monuments in each town square, these are patriotic communities who sacrificed dearly to support their new country, all the way back to the Civil War. Travel across Pennsylvania's portion of the Grand Army of the Republic Highway for an excellent ride, not just because of the long sweeps and turns as it crosses the state, but because this historical highway offers a chance to rediscover a time gone by. Eat in 1930's diners, walk on the famous Kinzua Trestle bridge, ride a steam train, descend into a coal mine, and above all, meet a proud people with stories to tell--All on Pennsylvania's Grand Army of the Republic Highway. Photo submitted by visitor in May 09 - "Kinzua Dam"
Leaving the eastern Pennsylvania town of Milford, you will begin to climb a long, winding road out of the Delaware River Valley. You will soon be treated to a series of sweeps and winds as the two-lane road crosses the first of many hills and ridges along the route. Heading west, the Grand Army of the Republic Highway begins to wind its way through hardwood forests, past small lakes, typical of the glacier worn Pocono Mountains. Ages ago, grinding glacial ice smoothed the once rugged peaks, partially filling the valleys. The result is a highway that trades large differences in elevation for a road that continually rises and falls, and turns in long flowing sweeps--A delight for any motorcyclist. Gearing down near Carbondale, a decision has to be made--take the new Route 6 expressway along the ridge above the town, or follow the original highway down into the valley. The expressway by-passes Carbondale and several other small towns. It has a pull-off that provides a panoramic view of the valley, including a small mining operation below. If you opt for the valley ride, a quick right turn will put you on Business 6, which immediately starts a long descent. It soon becomes obvious why numerous signs warn truckers to choose the expressway. After Route 6 passes to the north of the city of Scranton, the road slowly climbs towards the town of Clarks Summit. Before long, it road changes direction and descends into the Susquehanna River Valley. For forty miles, Route 6 stays with the river, rising and falling as it follows the hillsides to the north. The Susquehanna can be seen below winding its way across Pennsylvania?a swift moving, shallow, and generally un-navigable stream. As you follow the river, at times the highway leaves its side to climb a series of five long grades. Fortunately, each grade has a passing lane, so getting around those heavily laden lumber trucks and other freight haulers is quickly accomplished. After the town of Wellsboro, you will be surrounded by dense woodland as you pass through the Allegheny National Forest. Eventually you will come back to civilization as you descend the Allegheny Plateau near the village of Sheffield. We are not yet out of the mountains. 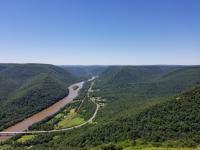 U.S. Route 6 now winds its way through a series of valleys, following the Allegheny River and its tributaries. Nine miles west of Union City, U.S. Route 6 joins with Route 19, and heads south to Meadville.. South of Saegertown, traffic increases and the highway becomes four lanes. It soon joins with Route 322 as it becomes a commuter highway. Near Conneaut Lake, U.S. Route 6 leaves Route 322 and once again becomes a two-lane country road. It travels northwest, winding around the Pymatuning Reservoir to the small village of Pennline, the last Pennsylvania town along U.S. Route 6. Photo submitted by visitor in May 09 - "Sweden Valley Inn"
Visit the old coal mining towns of Honesdale and Carbondale then take a small detour to Scranton. Route 6 approaches the northern edge of the city. A short side visit down Route 11 will offer you two world-class attractions, Steamtown and the Lackawanna Coal Mine. A National Historic Site, Steamtown is operated by the National Park Service. It houses numerous steam locomotives and includes an operating roundhouse where these steam giants are restored. Visit the museum, tour the restorations in progress (it's loud), and ride on a steam train. Nearby is the Lackawanna Coal Mine. Descend 300 feet into this anthracite mine to explore first-hand the hard lives of the deep shaft miners who toiled daily in what can only be described as grim conditions. For more information on the lives of these immigrant miners who came from 36 ethnic groups, you can also stop by the Pennsylvania Anthracite Museum while in Scranton. Much of Wellsboro could easily pass for a well-kept 1930s town. Its picturesque Main Street includes a park-like median, complete with gaslights. Eat at the famous Wellsboro Diner. A porcelain-shelled beauty, it's an excellent example of the diners of the '30s, transported, in pieces, to its current location in 1939--it's cash only. Just eleven miles out of Wellsboro on Route 660, is one of the most beautiful views in the area - the spectacular Pine Creek Gorge, better known as The Grand Canyon of Pennsylvania. Created by glacial action over 10,000 years ago, the gorge is 47 miles long and drops almost 1500 feet at its deepest point. The Pennsylvania Lumber Museum is located along Route 6 near Galeton. It includes a number of restored buildings that replicate a lumber camp of the 1800s. In this area of Pennsylvania, the lumbering of white pine and hemlock was a major industry that rivaled coal mining. Smethport, "Home of the Hubberburger." We can't pass that by. A stop for lunch at the old Smethport Diner. The diner is an old roadside eatery, similar to Wellsboro's Sterling Diner, except that the years have not been as kind to it. Turn right at Mount Jewett and travel slowly down a heavily patched road, heading for the famous Kinzu Bridge. It's just a twelve-mile detour from U.S. Route 6, but well worth the time. The Kinzu Railroad Viaduct was originally built in 1882 to ship bituminous coal across the Kinzu River Valley, north to New York. Rebuilt in 1900, the bridge is over 300 feet high and 2053 feet long. For many years, it held the record as the highest and longest railroad bridge in the world. Once listed as the Eighth Wonder of the World, the viaduct is still on the National Register of Historic Places and has been designated a National Historic Civil Engineering Landmark. - View the weather forecast for this area from Yahoo weather . - Online tour of the Grand Army of the Republic Highway- Route 6. For the adventurous, ride Route 6 from coast to coast. This historic highway once boasted the title, "Longest Highway in the USA." on July 3, 2009 5 out of 7 members found this review useful. In late May my son (age 21 and riding a '05 sportster) and I rode Rt. 6 from the New Jersey state line to Kane, PA. We then took Rt. 66 S through the Alleghany National Forrest. This was one of the most beautiful and nicest rides Ive ever taken. Rt. 6 is like going back in time  relaxing and enjoyable. I highly recommend this ride. We made it a 4 day, 3 night trip. From Kane we headed south to Horseshoe Curve in Altoona, then south to Rt. 30 which we took east back to Bucks County. We made it a point to stay off all major roads bigger then Rt. 6 & 30. Great trip!! on April 13, 2014 4 out of 5 members found this review useful. Each year I visit my home town of Elmira, NY. Last year I visited the Tunkhannock Viaduct just north of Scranton. I took Rt.6 from Scranton to Rt.15 and rode one of the most beautiful roads in PA. Be sure to pull over at the scenic overlook of the Susquehanna River. This summer I plan to ride the rest of Rt.6 and visit the Kinzua sky walk. on January 16, 2016 2 out of 2 members found this review useful. on February 20, 2011 2 out of 3 members found this review useful. on June 1, 2010 2 out of 3 members found this review useful. Great Route, and lots to see just off of Rt. 6 as well. Good way to get introduced is to check out the Tour Group from Wellsboro, PA... Canyon Vista McTours. They have a web site. Good tours, good food, good lodging, special attractions, and lots of colorful details about the area. Good value for the money. on January 25, 2016 1 out of 1 members found this review useful. Route 6 and some of the connecting routes are totally awesome! If you like a great road with very little traffic populated with 'mom/pop' motels and places to eat this is the place! Run this road on a regular basis and enjoy every foot of it! on July 6, 2013 1 out of 3 members found this review useful. This was a great ride and I enjoyed seeing all the sites and great views along the way. there was so much to see I cannot wait to ride it again to see some of the stuff I drove by. Really enjoyed lunch at the Sweden Valley in outside of Coudersport. on January 22, 2013 1 out of 2 members found this review useful. I have ridden this road many times and love the views along the way and have stopped in at all the places people have spoken about in there reviews. We really enjoy having lunch at the Sweden Valley Inn, Wellsboro Dinner and Roma Gardens in Kane along with other great establishments on the route, it is almost like going back in time. on August 21, 2011 1 out of 2 members found this review useful. Just might be the best ride in the state. Don't forget to visit the Wellsboro Diner when in the area. Beautiful roads in beautiful country. on November 7, 2010 1 out of 3 members found this review useful. on November 5, 2010 1 out of 2 members found this review useful. When going through Smethport try Myra's Restaurant. It's actually in East Smethport so just keep following RT 6 through town and its out by the Fairgrounds. Very good food, good quantity and good prices too. I'm a little biased since Myra is my cousin but it is a really good place to eat. Enjoy. on October 21, 2010 1 out of 2 members found this review useful. on October 6, 2010 1 out of 2 members found this review useful. From Milford, PA to Wellsboro along Rt. 6...one of the finest motorcycle roads I have ever ridden [Scranton area not so spectacular, though]. Sweeping turns bordered by spectacular vistas of low mountains and river valleys, charming little towns, good roads. Chris's B-B-Que is a great place for vittles along the way. on August 24, 2010 1 out of 1 members found this review useful. Having retired and living in Tioga Co. I have a few fav. rides. Starting in Wellsboro, I take rt 287 south to rt 220. Hang a right a go to rt 44 north. Take 44 up to Coudersport and pick up rt 6 east back to Wellsboro. I always stop at the Ox Yoke Inn for some good food. Ken and Megan will treat you right. on March 4, 2009 1 out of 2 members found this review useful. I have taken Rt 6 as far as Wellsboro heading west from Millford, road quality was one of the best I have rode on in PA. If you hit Wellsboro take the time to stop and see the PA Grand Canyon,it's about 5 miles outside of town.The views are breath taking and the ride to the edge of the canyon rim is a lot of fun. on November 18, 2016 0 out of 0 members found this review useful. i have been on various sections, but never rode the whole route. a lot of small towns that allows you to get fuel, food, and lodging. a lot of of places to stop and visit. up and down the mountains. you will not be disappointed. watch for the speed limits in the village of gaines east of galeton. dont expect a lot of twisties, but the road surface is always in great shape. on August 31, 2013 0 out of 1 members found this review useful. Really enjoyed this route ,came down from the Peace Bridge Fort Erie ,caught Hwy 6 near Warren.Stayed two nights at Colton Point motel & visited Pa Grand Canyon definitely worth the side trip .Did the Tiadaghton & Worlds-End Tour also a must .Continued on to Scranton & headed north from there. Surprisingly there was quite a bit of heavy truck traffic but wasn't intimidating. on August 1, 2011 0 out of 1 members found this review useful. We did some of Route 6 last weekend and it was great. We started around Marysville on Route 11 north. Then picked up 92 north to route 6 west. Back down to Marysville on Route 15 south. Incredible views! Roads were very nice, not much traffic, which surprised us on a Sat. Stopped at a few restaurants along the way and a scenic stop overlooking one of many valley views. Took about 9-10 hours round-trip at a nice cruising speed. We did encounter lots of water trucks, probably related to the drilling. We plan on going all the way west next time around. Maybe even stop at lake Erie. This is going to be one of our regular rides now! on December 25, 2010 0 out of 1 members found this review useful. August 01,2010 Four of us rode in the area of Wellsboro for 5 days and the best ride was taking a run around the Allegheny National Forrest & Kinzua Dam, the roads were fantastic and the views are breath taking we rode 280 miles that day. Also the Grand Canyon is a must see while you up that way . on September 28, 2010 0 out of 0 members found this review useful. i've ridden bits of Hiway 6 in PA, from Troy to LaFayette on a bike, and done points west of 219, in and around the Allegheny Natl Forest by car. it is truly fabulous. the old diner in Wellsboro is WELL worth a visit, so is the Pennsylvania "Grand Canyon". the most amazing thing about it is the seeming lack of traffic. (this may have changed a bit with the advent of the drilling of the Marcellus Shale) i'd recommend that anyone headed east or west thru Pennsylvabnia make the effort to ride this route. you won't be disappointed. in the 2nd week of October (2010) i will head up there to stay with a bunch of friends in the Ox Yoke Motel around Galeton, west of Wellsboro. we plan a weekend of riding, i am certain it will be just great. on September 26, 2010 0 out of 0 members found this review useful. Rode from the Pittston area to the PA Grand Canyon on Sept. 18. Route 92 to Route 6 was about 130 miles. The leaves just started to turn color another week or so later would have been amazing, Be sure to stop at the scenic overlooks and at the memorial for the Bradford County Deputy Sheriffs that were killed in the line of duty. Plan ahead if you are going to need lodging! The gas drilling employees have all the hotels/motels booked. Mid 2010 August ride from Milford to rt 219. What a ride! Some of the best scenery in PA and one of the nicer roads I have been on. Strongly suggest this ride to anyone who has a couple of days to burn. However, if you plan to stay in a room along the way, you might want to book ahead! The well drillers have all the hotels booked, every night! on July 4, 2010 0 out of 0 members found this review useful. on April 22, 2010 0 out of 0 members found this review useful. I grew up just North of Rt. 6 in a little town called Sunderlinville, and went to Galeton Area High School, which sits right on 6. When I got my first motorcycle in 1988, I rode from Wellsboro to Kane and back, and have ridden on the stretch between Wellsboro and Galeton more times than I can even count. It is truly a beautiful stretch of highway, with plenty of 'small town' atmosphere to enjoy and lots of interesting sights to see. I now live in Ohio, and get back home quite often, and riding Rt. 6 is the highlight of the trip. Early autumn when the foliage is changing may be the most beautiful ride on Rt. 6 ever. on June 4, 2009 0 out of 0 members found this review useful. Great ride! There are so many things to see on this route. Wonderful little towns to pass through and great road quality. You must stop at the bridge and the pa grand canyon. on August 6, 2008 0 out of 0 members found this review useful. We take 6 at least once a year on our way to Austin, Pa. Which by the way is also a nice ride. (Coudersport south to Austin on 155). The Kinzua Bridge sadly was taken out a few years ago by a tornado. Too bad, It was an awesome site. on March 14, 2008 0 out of 0 members found this review useful. If you ever take the same trip again, when you get to Smethport take RT 59 down through the Kinzua Dam, right before that there is a marina call the the Wolfrun, nice place to rest and eat. It's all National Forest through there. Plus 59 takes you right back on RT 6 in Warren. on January 2, 2008 0 out of 0 members found this review useful. Rt. 6 western alternate route of Rt 6N also is an awesome start or finish to a Rt. 6 experience. Rt 6N takes you to the PA-Ohio Line and Lake Erie lakeshore.